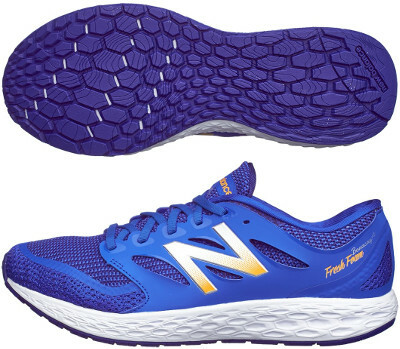 New Balance Fresh Foam Boracay v2 are neutral cushioned running shoes. The new New Balance Fresh Foam Boracay v2 (980 v3 actually) is the least popular Fresh Foam model from Boston's brand. More responsive than flagship 1080 Fresh Foam and more cushioned than speedy Fresh Foam Zante v2, the Boracay v2 is a lightweight model for daily training and a great choice to tackle long distances for neutral runners. Upper from Boracay v2 follows bootie construction trend for enhanced comfort and different kind of breathable mesh depending on the area to provide flexiblity and structure where needed. A plastic piece is present around the midfoot for snug fit (similar approach as Adidas Energy Boost 3). Midsole in New Balance Fresh Foam Boracay v2 is completely made of the third iteration (first one was in the 980 and second one in its predecessor Boracay) of the flagship material from New Balance (in a similar way as Adidas does with Boost™) featuring plush (not mushy) cushioning with some stability depending on hexagonal geometry configuration of each area. Outsole has been redesigned with different size elements depending on the area for smooth transition while crash pad remains untouched.